Discussion in 'Card Hunter General Chat' started by BUSSM1593, Apr 2, 2018. Are the 6 fire damage "Melee" damage? The first six damage are melee, the end of turn damage (from the attachment) is fire, I believe. The first 6 are melee piercing damage targetting the char. The burning is untargetted fire damage. The burning may be magic damage instead of melee... I think that was done to stop Barbed Platemail from injuring its owner. The first 6 damage are melee piercing, as written on the card. The following damage are melee fire, which means Polearm Slash can reduce the damage and Shimmering Aura cannot. Sir Veza, tolkien, wtfisAPC and 1 other person like this. Which turns Polearm Slash into something truly special. Right? 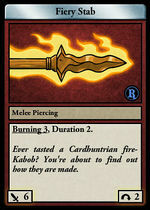 its in this context noteworthy that the fiery stab fire can be upped by the firemage traits (and instant burn)... In case you like battlefield training shenenegans. Safe to say Kindler would too, i guess. fwiw, I just took fiery stab burning damage in mimetic armor, and it gave me a bludgeon . . .